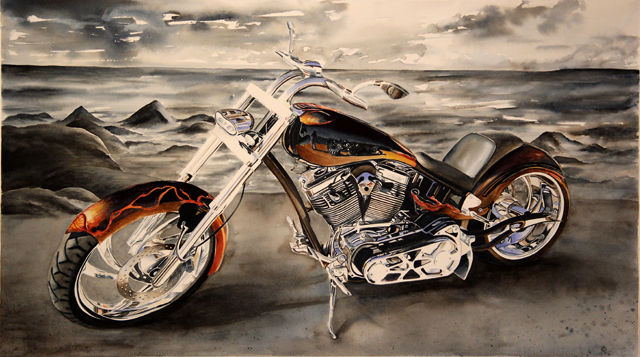 Motorcycles, House portraits, & other Commissions! 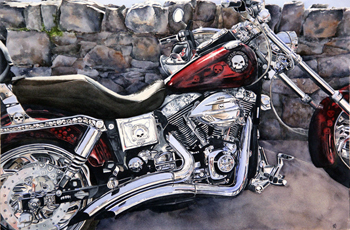 I have painted commissions of Motorcycles, Cars, Homes, Flowers, and other subjects. If you are interested in immortalizing your favorite item or just want a painting of a particular scene, contact me for a price quote. Pricing is dependent upon size and complexity. From the family homestead to a brand new home, a house portrait makes a wonderful gift that loved ones will cherish for years to come! 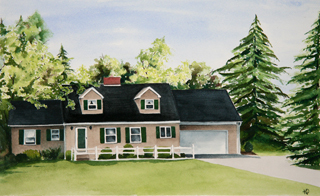 Send a photo, either e-mail or snail mail, of the house you would like painted. Try to get the photo(s) in morning or afternoon sun, if possible. All house portraits come with a white mat. Custom framing is available upon request. Some of Kathie's commission paintings can be viewed on the "Sold Paintings" page. If you would like me to contact you, just leave me a message.